This article is about the film. For the novel, see The Runaway Jury. In New Orleans, a failed day trader at a stock brokerage firm shows up at the office and opens fire on his former colleagues, then kills himself. Among the dead is Jacob Wood. Two years later, with attorney Wendell Rohr, Jacob's widow Celeste takes Vicksburg Firearms to court on the grounds that the company's gross negligence led to her husband's death. During jury selection, jury consultant Rankin Fitch and his team communicate background information on each of the jurors to lead defense attorney Durwood Cable in the courtroom through electronic surveillance. In the jury pool, Nick Easter tries to get himself excused from jury duty. Judge Frederick Harkin decides to give Nick a lesson in civic duty and Fitch tells Cable that the judge has now given them no choice, and that he must select Nick as a juror. Nick's congenial manner wins him acceptance from his fellow jurors, but Frank Herrera, a Marine veteran, takes an instant dislike to him. A woman named Marlee makes an offer to Fitch and Rohr: she will deliver the verdict to the first bidder. Rohr dismisses the offer, assuming it to be a tactic by Fitch to obtain a mistrial. Fitch asks for proof that she can deliver, though, which Nick provides. Fitch orders Nick's apartment searched, but finds nothing. Marlee retaliates by getting one of Fitch's jurors bounced. Nick shows the judge surveillance footage of his apartment being searched, and the judge orders the jury sequestered. Fitch then goes after three jurors with blackmail, leading one, Rikki Coleman, to attempt suicide. Rohr loses a key witness due to harassment, and after confronting Fitch, decides that he cannot win the case. He asks his firm's partners for $10 million. Fitch sends an operative, Janovich, to kidnap Marlee, but she fights him off and raises Fitch's price to $15 million. On principle, Rohr changes his mind and refuses to pay. Fitch agrees to pay Marlee to be certain of the verdict. Fitch's subordinate Doyle travels to Gardner, Indiana, where he discovers that Nick is really Jeff Kerr, a law school drop-out, and that Marlee's real name is Gabby Brandt. Gabby's sister died in a school shooting. The town sued the gun manufacturer and Fitch helped the defense win the case. Doyle concludes that Nick and Marlee's offer is a set-up, and he calls Fitch, but it is too late. Nick receives confirmation of receipt of payment and he steers the jury in favor of the plaintiff, much to the chagrin of Herrera, who launches into a rant against the plaintiff, which undermines his support. The gun manufacturer is found liable, with the jury awarding $110 million in general damages to Celeste Wood. After the trial, Nick and Marlee confront Fitch with a receipt for the $15 million bribe and demand that he retire. They inform him that the $15 million will benefit the shooting victims in Gardner. The film had been in pre-production since 1997. Directors slated to helm the picture included Joel Schumacher and Mike Newell, with the lead being offered to Edward Norton and Will Smith. The novel's focus on big tobacco was retained until the 1999 film The Insider was released, necessitating a plot change from tobacco to gun companies. The film grossed $49,440,996 in the United States and $80,154,140 worldwide. 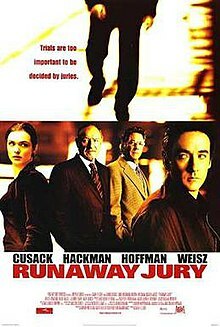 Runaway Jury received generally positive reviews from critics, garnering a 73% rating on Rotten Tomatoes, with the site calling the film "an implausible but entertaining legal thriller." On Metacritic, the film has a weighted average score of 61 out of 100, based on 38 critics, indicating "generally favorable reviews". Audiences polled by CinemaScore gave the film an average grade of "A-" on an A+ to F scale. Roger Ebert gave the film three out of four stars and stated that the plot to sell the jury to the highest-bidding party was the most ingenious device in the story because it avoided pitting the "evil" and the "good" protagonists directly against each other in a stereotypical manner, but it plunged both of them into a moral abyss. John Grisham said it was a "smart, suspenseful" movie, and was disappointed it made so little money. ^ "Runaway Jury". Rotten Tomatoes. Retrieved 16 October 2017. ^ "Runaway Jury reviews". Metacritic. Retrieved 16 October 2017.